Tapir: Black looks overconcentrated in the upper left, the upper right is big but not territory yet. The white group happily escaped and isn't weak / even strong after and it's strength is directed to the more interesting areas. White made sanrensei with and had nothing to worry in the game. But honestly, all this said, I would estimate Black being ahead by a couple of points. What do you say about this position? Velobici: Black 2 is a big point? does not gain territory for Black nor does it attack the White group. Neither is an urgent point; it does not affect the stability of either the White or Black groups. The bottom is more developable for White than the right side. The left side is more developable for White than the right side, though the bottom is better than the left side. Black's stones are overhanging the left and will be able to limit White's development there. Don't believe that is either urgent or big. White is behind in both territory and power (to use terms of Attack and Defense). Whites stones are splitting two strong Black groups (top center and top right). Splitting strong groups is not useful. Rather than , a play at a might be more useful. If White pincers, take the 3-3 point and either White has to block on the wrong side (the left side) or White ends up with a outside position on the bottom that does not coordinate with the inside position on the top left. If White does not pincer, Black can establish a position on the bottom and its hard to see how White will gain enough power to create the territory needed. How did the position arise? Dieter: Both and are too close to thickness, or at least not very efficient. seems to say " shouldn't have been there at all". In Go, you must make maximum use of existing stones, not treat them as if they shouldn't be there. If White wants to patch up the group's thickness, a play at a is more efficient. While did not mind about being overconcentrated, doesn't care about the combined strength of and . There is no development possible for towards the centre and if approaches at b, then an invasion at c is threatening. I agree Black should have played away from thickness and move at d instead of . For now, I would hesitate between e (being biggest) and b (being more active) with a final vote for e since it is difficult to prove it wrong. FredK: "But I'm happy that I did take the time to strengthen my group with " -- You should also be happy that B took the time to play . To put it a little differently from the analyses already given by Velobici and Dieter, playing near a live group is small. is near two live groups, B's and W's. As stated above, the bottom is wide open and ripe for development (and far from live groups). As for Dieter's choice between b and e for , it seems to me that after a W move at b the threatened invasion doesn't threaten the life of B's group, but a move on the bottom will then have become even bigger and B would grab it. So one could make the positive argument that W should therefore play there (at e)first, and not play near already live stones at b.
Tapir: While I appreciate all comments, I'm indeed happy that I now do take the time to strengthen weak groups, which allowed me to play actively afterwards. If you take into account that was basically an answer to the marked black stone, the marked white stone still looks misplaced, but isn't at least superior to the marked black stone? Any comments on at f which was my move in the game? Does anyone dare to make a numerical guess? How many additional points do you need to prefer white? Dieter: To answer the last question: I count Black's upper left as 40 points which are 75% certain, so 30 points. The central groups have comparable influence with a small advantage for White. So, if next comes a san-ren-sei, I'd say White has already overcome the komi. But these estimations seem to miss the point. Therefore, another diagram. A simple connection, without any enemy stone at all touching it, in the centre, is strange. has almost the feeling of a pass move. already covers the weakness allegedly introduced by . Maybe the local shape of in conjunction with is too familiar to realize how inefficient is. If you are happy with taking the time to fortify somewhat floating groups, then try to maximize the work done by the stones and play at a: it influences the centre and bottom bigtime. Tapir: Some hours later, I don't think is correct anymore. Directly sliding in from the other side, strengthening the white group looks better. White can either take the corner (3-3) or approach from the other side. Velobici: Agreed. The two marked White stones are not strong. The slide to the left gives them better shape similar to that shown in the Distant low approach fuseki diagram on the 4-4 point Josekis page. Would hesitate to invade at the 3-3 as Black will block on the top further weakening those two stones. unkx80: Shouldn't you play at , not letting Black hane at the head of two stones? Tapir: Indeed. I played because I thought white making a hane here doesn't work so well. But is an example of greedy play and wishful thinking (I hoped Black will respond at sansan). Black is an unusual move which occurs rarely in professional play. 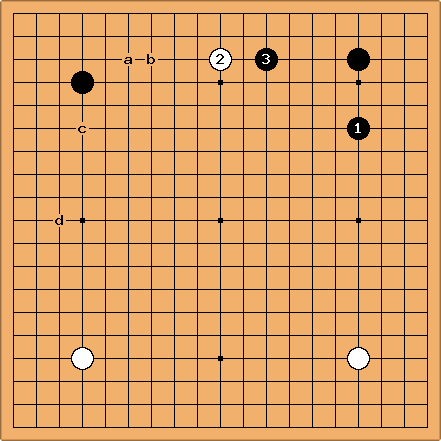 Yu Bin appears to have tried it several times in 1995 leading to games with the position shown above. At that point played either a or b. In each case, Black responded on the left side and played the one space jump down the left side from the handicap point stone (at c) either immediately or after an intervening move at d. However, it appears that other professionals did not adopt Black's play of and . This pattern has not occurred (as of February 2008) since 1995. occurs about as the fifth move in only about a dozen games from 1995 till now (as of February 2008). See also 3464 Enclosure Statistics. unkx80: I am not sure is "wrong". The result looks okay after and ? Tapir: I feared the crosscut here. That's why i simply stretched.